With a drop in average annual rainfall in recent years, the Australian government has released billions of dollars in funding to develop the water infrastructure needed to optimise and conserve water use and make cities more resilient. The commercial sector has also been addressing water efficiency with various approaches, one example being Barangaroo, one of Sydney’s suburban districts. The concept of being truly net positive water is contentious, but Veolia’s regional energy manager and project manager, Matthew Lee, explains it as “exporting more treated water from a site than the amount of potable water taken in”. 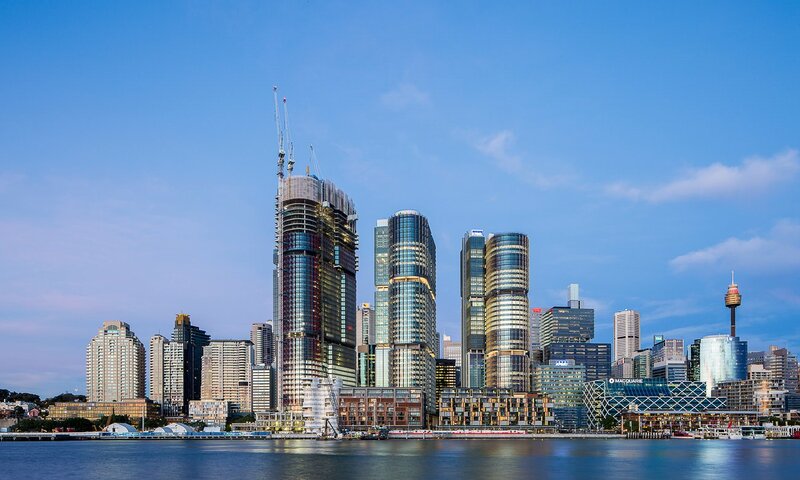 Lee is working to make Lendlease’s Barangaroo South development in Sydney (consisting of three main commercial towers, three 10-storey residential buildings, and several multi-use buildings) net positive water. This is part of the plan to make the project the first large-scale carbon neutral community in the country. Barangaroo is also committed to the C40 Cities – Clinton Climate Initiative’s Climate Positive Development Program. But how do you actually create more water? In the case of Barangaroo, all water used and produced on the site will be recycled; the usual greywater and blackwater will be captured from toilets, showers, laundries, waste rooms and restaurants, while additional water will be pulled from rainwater harvesting, cooling tower backwash, and – during times of low load (i.e. night time) – from water mined from Sydney Water’s sewer main. Lendlease expects that up to 500,000 liters of potable water a day will be used at Barangaroo South once it is completed, with the recycling plant producing up to 1 million litres of recycled water a day. Although there are no agreements in place yet, Sydney is helping to promote the use of recycled water by building a ring main that can connect businesses to Lendlease’s recycled water system. There are also plans to export recycled water to new buildings nearby, such as the Crown Sydney Hotel Resort and One Sydney Harbour, due for completion in 2021. If no one signs up to use the recycled water, the development will not be net positive water but “net positive water ready” – as is the case with several other developments in Australia, such as Flow System’s water recycling plant in Sydney’s Central Park. The precinct will continue to use the recycled water on site. The following video shows the making of Barangaroo.